Ex-YCW leader, Sarasvathy Muthu, who was arrested recently under Malaysia’s harsh internal security laws, has taken out this year’s Yayori Award for her work with marginalised people. The Yayori Award honours women who work at the grassroots level with socially marginalised people to create 21st century free from war and discrimination against women. Established in 2005, it recognises those who best emulate the passion and courage of the late Yayori Matsui, a pioneer woman journalist and women’s right activist in Japan. This year’s winner is Saraswathy Muthu (Saras). 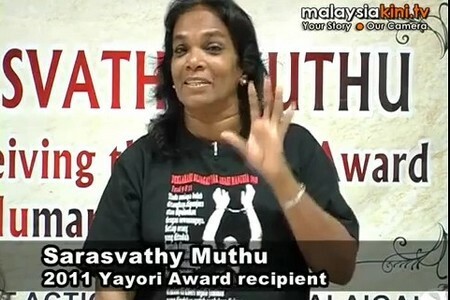 She was chosen for her tireless work at raising public awareness of the plight of marginalised communities – and in particular, women – in Malaysia. The award ceremony will take place in Tokyo on 3rd December 2011.